Adobe released new specifications for their DNG (Digital NeGative) file format. Now at version 1.2 it has been offered to the ISO as the basis for an international standard camera raw format for camera manufacturers and software vendors. Adobe is also pursuing a DNG format for motion picture. What is Raw and what is DNG? All digital cameras nowadays can capture in JPEG format, which is essentially a finished file. Strictly speaking they capture in RAW and convert to JPEG on the fly. However before JPEG capture, digital cameras could only save in TIFF or RAW. RAW captures all the information before conversion which can be done later in a comfortable, colour managed studio. RAW files require special software or a Photoshop plug in to open and then save as a more accessible format such as JPEG. Most camera manufacturers who let you capture in a RAW format do so by saving it in a proprietary file format such as Nikon NEF and Canon CR2. They do not document how it is written or how to access data within it. Every new camera produces a new and different RAW file format totally incompatible with any others. Today there are hundreds of different camera RAW formats. There are secret herbs and spices within RAW files that camera manufacturers claim give them an edge on the competition. I’d have to agree somewhat; Kodak (did) make the best RAW file with DCR, Nikon is very good, and Canon are OK as well. Unfortunately we can’t objectively compare them because there is no documentation. Third party software vendors need to support hundreds of RAW file formats. Because they are competitors software vendors do not share this information. As far as I know only Pentax offers to help software companies who want to support their RAW files. Big companies like Adobe and Microsoft get some assistance from Canon and Nikon. Along with other software companies Adobe spend a lot of time and money reverse engineering the hundreds of RAW file formats. That is time that we users pay for in the updates. If there were a common RAW format it would save Adobe and everyone time essentially wasted second-guessing all these RAW files. With each new digital camera release manufacturers create yet another RAW file format. So Adobe created DNG and offer documentation and a software development kit (SDK). So far only a couple of camera manufacturers have taken up DNG as their native file format, most notably Leica. Dozens of software companies can display DNG and write metadata. A few can even convert them to JPEG or TIFF. But only a few companies outside of Adobe create or convert to DNG. By year’s end there will be several software companies that can actually write or save to DNG files. You might say DNG is a religion such is the polarity of views on it. Indeed it does have some philosophical aspects to it. Like many I like to think I’m in the middle and level headed. 🙂 There are both philosophical and practical reasons to “convert” to DNG today (pun intended). First though, what do you lose in the move? Well your camera manufacturer’s software doesn’t read DNG, unless you have a Leica M8. Your choice of RAW converter today is in practice limited to Adobe. There are some small companies that offer limited support but nothing for the mass market. So make sure you like Adobe’s colour engine and rendering! Phase One Capture One 4 sort of supports reading DNG and in terms of popularity is second only to Adobe Camera Raw. Nevertheless the plusses far outweigh those limitations. DNG lets you save adjustments made to RAW files safely inside the file. You can revisit them later when you or the software has improved. You can also add IPTC metadata and embed a JPEG file that reflects your adjustments. Those embedded JPEGs can even be full resolution if you like. Many applications use that JPEG and can export it. Because DNG is a documented format it will most likely survive longer than the proprietary RAW files your camera captures. I reckon Ansel Adams would use DNG for that fact alone. DNG 1.2 adds to that recipe by letting you save multiple renderings of the same file within the same file. And save multiple JPEG previews, again full size if need be. Those settings and JPEGs can be from multiple RAW converters too. Previously JPEG previews were sRGB. 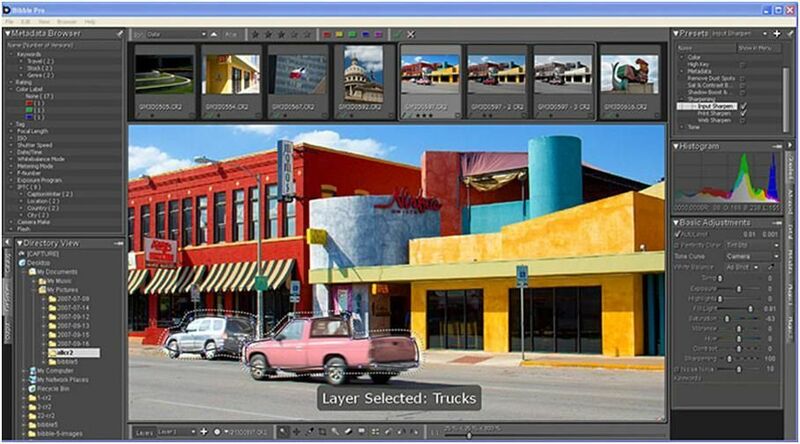 With DNG 1.2 you can store them as Adobe RGB (1998) which basically means more colour information. Competitors didn’t like being limited to using the Adobe colour pipeline so DNG 1.2 offers alternate ways to record that data. DNG 1.2 also offers the user a method of recording their own “styles” or what Adobe refers to as profiles. Strictly speaking they are not colour profiles which only work in controlled photographic environments such a studio. What styles let you do is tweak the colour response to record how you interpret the scene. Important for DAM is the ability in DNG 1.2 to record a hash of the RAW file once converted. A hash allows you to monitor forever after the integrity of the DNG file, test backups and avoid file corruption. Expression Media 2 – Released! Microsoft Expression Media 2 is now out as a final release. Full price is US$199 and the upgrade US$99. After two years Microsoft have done little to improve what was iView MediaPro. The latter was far and away the clear favourite application for creatives to manage their digital assets. Much of what made iView a winner is still there in Expression Media; friendly interface, ease of use, powerful capabilities, cross-platform, use of open standards, coping with terabytes of data, speed, etc. However time marches on and the competition in DAM applications, especially for photographers using camera raw formats, is fierce. But for all appearances iView/Expression Media seems to have remained stagnant. As a consultant I have been privy to a lot of the behind the scenes work on Expression Media 2, probably more than most. I know a lot of work has gone on to make iView more secure and stable so as to wear the Microsoft brand, especially the Windows version. That is not to say iView was a poor product, but there were holes mostly via Apple QuickTime that could be used to hack another Microsoft application, a little product called Windows. And I’m guessing Microsoft must have been reeling at the thought of their product relying so heavily on Apple software. Just to be clear Microsoft as a whole are not too concerned with Apple, after all the second biggest selling app on Mac is Microsoft Mac Office and Boot Camp helps Windows sales. OK so we get more stability and security on Windows and Mac with Expression Media 2. Rather than crash and take the Catalog database with it Expression Media 2 now skips files that would previously choke iView, it will attempt to save Catalogs if you go over the 2GB database limit, offers multi-user access to a Catalog, the Windows version is many times faster accessing items over a network, plus other performance enhancements under the hood. Expression Media 2 is now multi-threaded making it much faster at importing. You can safely work on images while Expression Media 2 is still importing or doing other tasks in the background. Some bling is in there for those who tag images with GPS data. Geo-taggers can access Microsoft Virtual Earth from within Expression Media 2. It looks good especially for rehearsed demonstrations but could be much better. Being able to select images then drag onto a map would be more intuitive. Hierarchical keywording is the feature that I find most exciting. Not just because you can now keyword using a hierarchy, many applications offer that. Microsoft lets you read and write the hierarchy in the file using the Adobe Lightroom XMP namespace. That makes your keywords roundtrip with other applications that also use the same namespace. Of course your keywords will still be written to the standard IPTC keyword field as well. In the tradition of iView hierarchical keywords are saved to a common standard. Isn’t that great? Well it could have been. But there are major bugs that prevent me from recommending this upgrade. Amongst them are bug with keywords. iView was one of the first applications to support IPTC Core and XMP. It was also amongst the first to read Adobe XMP sidecar files. So if you add metadata to RAW files in Adobe Bridge or Lightroom then import them into iView/Expression Media it would read the information and add it to the Catalog just as if it were inside the image. In Expression Media 2 most of the metadata from XMP sidecar files is randomly lost making it unreliable. Other bugs on Windows are guaranteed crashes with slideshows, heavily over-saturated rendering of Nikon NEF RAW files, and the US$99 upgrade price. What was that last one? Microsoft needed to offer this upgrade for much, much less to loyal iView and Expression Media 1 users. OK perhaps not free, but somewhere in the vicinity of US$29. Although free would be good too! iView had a ridiculously loyal user base verging on what Apple has with Mac owners. When Microsoft bought iView they were behind the eight ball because of who they are perceived to be. If it was an Adobe acquisition I imagine users might rejoice. Microsoft needs to work doubly hard to win loyalty amongst creatives. While unfair it is a fact. Releasing an update and telling patient users it is primarily a bug fix but pony up US$99 anyway is one thing. But when that update has bugs that prevent people using it is another thing altogether. One plus publicised by Microsoft for iView users is the large backroom of quality assurance engineers. So, where were they? This all gives ammunition to the Microsoft cynics. iView had a very nimble team of engineers that could fix problems within weeks when necessary. Large software corporations naturally take longer, and they don’t get any bigger than Microsoft. However the second biggest software vendor recently demonstrated that they could admit fault and fix major bugs within weeks. I know for fact that Microsoft is right now busy fixing a lot of bugs for the Expression Media 2 in Service Pack 1. It needs to be out really fast, within weeks not months. And they need spin doctors to tell us so. There is much rumour on the Internet about a Microsoft competitor to Adobe Lightroom and Apple Aperture. The move of the Adobe Lightroom lead engineer over to Microsoft adds fuel to the speculation. All I will tell you is don’t believe everything you read. However let’s assume there is such a product. With so many photographer feeling stung by iView/Expression Media do you think they will trust Microsoft enough to use it? Fixing Expression Media has ramifications outside the Expression suite. As mentioned in the last newsletter when previewing the beta there is much missing from Expression Media 2. The ability to move folders on Windows, breaking the 2GB catalogue limit, mapping custom XMP fields, true multi-user support, appending XMP sidecars, and showing which files have changed outside Expression Media. Years ago iView MediaPro was clearly the best DAM application for creatives. Today Expression Media is still the number one DAM application for creatives. But only just. Mark Anderson has been a DAM consultant long before we were using the term. His resource for Extensis Portfolio, the PortfolioFAQ at www.portfoliofaq.com, is a mine of free, independent information. I used the website and forum often when beginning to use Portfolio 4 then 5. Mark’s experience goes back five versions. The website really is a simple FAQ on Portfolio. But unlike a company FAQ on their own product PortfolioFAQ lists the good and bad points, and suggests practical workarounds for the latter. There is also extensive information on general best practice for DAM. When Extensis removed their forums, possibly due to many critical posts, PortfolioFAQ started their own forum. Even though Extensis have reintroduced their user forums the PortfolioFAQ remains as a valuable resource. Bibble Labs have given us a sneak peak at Bibble 5. Eric Hyman was showing a pre-alpha version at the Microsoft Pro Photo Summit last year. From the screen grabs we can see a much improved interface, a catalog, versioning, and layers. Along with these new features comes the familiar Bibble ones that make it popular; plug in architecture, dockable palettes, and logical layout. Bibble has always been the king of speed and my guess is version 5 will continue that trend. Adobe has released a public beta of Photoshop Lightroom 2. Be warned this is definitely a beta and should be treated as such. If you decide to try the beta expect bugs, only work on copies of images and consider your Lightroom Catalogs disposable. While testing I had some RAW files corrupted trying to move them between folders in Lightroom 2 beta. Mikkel’s Lightroom Adventure 2 book will be out later this year. Lightroom 2 has several great new features and some not so great. The Retouch Brush in the Develop module allows Local Area Adjustments of clarity, saturation, tint, and more. Paint the adjustments on and refine them, now or anytime later. These settings are non-destructive and can be saved to the file (or XMP sidecar). My guess is with the new DNG 1.2 specs you will be able to save multiple settings to the files. There is a new suggested keyword feature that uses fuzzy logic to guess what terms might be added. It is based on the time the image was captured along with how you have previously keyworded similar images. Smart Collections can set to automate mundane tasks by reading metadata or by manually adding images to the collection. For example I have a Smart Collection that converts my Nikon D200 images captured at ISO800 or above to B&W with noise reduction. If I photograph with the D200 at that ISO I pre-visualise them as B&W and Lightroom realises that vision. The Library Filter has moved to the top of the thumbnails and offers some powerful ways to find images quickly. Search across EXIF, IPTC and Lightroom settings. Unfortunately placed at the top the Library Filter crowds hierarchical information making it more difficult to access than in Lightroom version 1. Like Bridge, in Lightroom 1 we can access keywords via a vertical folder hierarchy. It is very intuitive to add or search by clicking on the keyword term know sub-terms will also be found or added. This is very difficult to see in Lightroom 2 when the Filter is shown horizontally along the top. Another cool addition is adding keyboard shortcuts to the Develop module adjustments. Using the + (plus) and – (minus) keys you can increase or decrease Exposure, Contrast, etc. The Tab key moves you between adjustments. This makes high volume jobs such as weddings and events easier to get through. Bibble and Phase One have had similar keyboard shortcuts for a while and it is a welcome addition to Lightroom that helps make the work flow. To those brave souls trying the public beta of Lightroom 2 I can tell you Adobe are listening to your suggestions. Already there have been great improvements and features added. No I’m not going to say what features! Last year Adobe commissioned me to write a workflow whitepaper based on Lightroom. Soon to be published you can find it if you Google “at last makes your work flow“. Don’t I wish I had registered that phrase! It’s that time of year again. PMA Australia is the largest imaging show in the southern hemisphere. There will be a lot of presentations on DAM at PMA Australia by Adobe, Apple, as well as DAMsimple. We’ll be giving a free talk or two, this time at the Canon AIPP Workshops. Visit stand 120 to see the presentation schedule. That’s it for this newsletter, stay tuned for the next one in September. Meantime keep ahead of breaking news at DAMsimple.com !